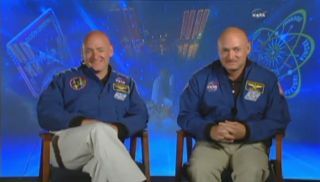 Identicaltwin astronauts Scott and Mark Kelly may have the ultimate brotherly bond. Theylook alike and talk alike, at times they even joke alike. Scottarrived at the InternationalSpace Stationlate Saturday along with two cosmonauts aboard a Russian Soyuz TMA-01Mspacecraft. Mark Kellyis on Earth. He is older than Scott by six minutes. He and Scott are the world's firstastronaut twins and expect to meet up in space in March 2011, when their two spacemissions will coincide during NASA's final flight of the space shuttleEndeavour. After Scott arrived at thespace stationSaturday, Mark called his brother from Russia's Mission Control Center nearMoscow. But there was a twist: Mark pretended to be his brother Scott, and pretendedthat the twins had swapped places just before the Soyuz launched on Oct. 7. "HeyMark, this is Scott. Six months is a long time in space, so thanks for switchingspots with me," Mark said. "Just hope I can remember how to fly thatspace shuttle!" "Thatis pretty funny," Scott replied with a smile. To be clear,Scott Kelly is definitely in space. In November, he'll take command of thespace station to lead the outpost's Expedition 26 crew. Mark willcommand Endeavour and dock it to the space station, where Scott will be incharge. "I'llmake sure to bring up all your stuff when I bring Endeavour up," Marksaid. Both Kellybrothers are using Twitter to chronicle their space missions. Scott uses thename StationCDRKelly, while Mark writes under the moniker ShuttleCDRKelly. When Markwalked his brother out to the launch pad Oct. 7, he posted photos from cellphone every step of the way. "It wasexciting to watch him rocket off into space one more time," Mark said onOct. 7. This is the third spaceflight for Scott Kelly. Mark also has flown onthree space missions. And thefamily connections didn't stop there for Scott. After thecall from his brother Saturday, Scott Kelly took a call from his teenagedaughter Samantha. He wished a belated happy birthday to her and his otherdaughter Charlotte, who both celebrated birthdays within the last few weeks. Samanthaasked her father for permission to get a new cell phone, and used his spacemission as what may be the ultimate bargaining chip for a teenager's need for amobile device. "Can Ihave an iPhone so I can keep up with your trip?" Samantha asked herfather. Kellyfeigned audio troubles from space. "I'm sorry,"Kelly said with a smile. "I didn't hear that." But that wasthe end of the space family small talk. The microphone at Russia's MissionControl Center moved on and Kelly and his crewmates got down to business. Scott andtwo Russian crewmates joined three other astronauts already living aboard thespace station when their Soyuz docked Saturday. The newcomers plan to spendabout 5 1/2 months at the station. Scott will take command of the station inNovember. In-jokes andsibling rivalry are nothing new for the Kelly twins. They grew up in WestOrange, N.J., were co-captains on their high school swim team, joined the Navyand even entered test pilot school at the same time. Still, theirparents worry when the Kelly brothers fly in space, and will likely worry twiceas much when both brothers are flying in orbit together next year. "Theycertainly get nervous when we fly, but I think it's like all parents do,"Scott told SPACE.com before his mission launched.